Analysis of the 2004 National Long-Term Care Survey reveals that when this cross-sectional nationally representative survey of older Americans was carried out, 14.3% of Medicare beneficiaries aged 65+ were enrolled in Medicaid. 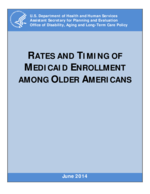 This cohort included older Americans both with and without functional disabilities or cognitive impairment, those residing in nursing homes and in the community, and elders who had become eligible for Medicaid both before and after reaching age 65. Within 4 years, an additional 4.7% of the cohort had transitioned to Medicaid, some while continuing to reside in the community, others in connection with nursing home stays other than short-term Medicare covered post-acute episodes. Multivariate analyses found the strongest predictors of post-baseline transition to Medicaid enrollment were continued survivorship and use of nursing home care. The next largest marginal effects of the predicted probability of transitioning to Medicaid were income (having income below $20,000 for transitioning within 1 year and below $30,000 in all years) and homeownership (not owning a home was a statistically significant predictor of transitioning to Medicaid throughout the follow-up years). In sum, older Americans in the lowest income quartile and those who were not homeowners were much more likely to transition to Medicaid during the 4 year follow-up period compared to older Americans who were in the highest income group. Elders in both the highest and lowest income groups were more likely to enroll in Medicaid if they used nursing home care than to do so if they remained in the community. However, those in the lowest income group were also vulnerable to Medicaid enrollment if they remained in the community, whereas the risk of enrollment in Medicaid among those in the highest income group was almost entirely associated with long-stay nursing home use.